Fight fans wanted it, and now they’ve got it, as all the action taking place inside the Octagon is now available on Xbox One thanks to the arrival of the UFC.TV app for the popular gaming console. This highly anticipated and often requested update – available for download now – will finally allow Pay-Per-View events to be seen outside of the United States and Canada, making all live events a click away. The timing of this update could not be more perfect, as events such as UFC 186: Johnson vs. Horiguchi, UFC 187: Jones vs. Johnson, UFC 188: Velasquez vs. Werdum, and UFC 189: Aldo vs McGregor will now be accessible through your console. With UFC FIGHT PASS on Xbox One, get access to the biggest library of fights and original programming, including this week’s exclusive live event from Krakow, Poland featuring the rematch between heavyweight stars Gabriel Gonzaga and Mirko Cro Cop. 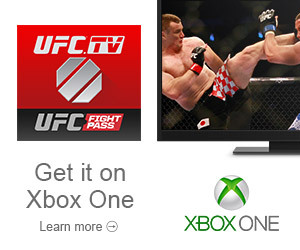 To get access and start your Free Trial of UFC FIGHT PASS within the UFC.TV app, visit UFC.tv/Xbox to subscribe to the UFC’s streaming service and then input your log-in information on Xbox One, opening up a world of fights from the UFC, PRIDE, WEC, STRIKEFORCE, INVICTA FC, and much, much more. Go to the Xbox Store and download now, then sit back and watch the best fights and fighters of the Octagon from the comfort of your home.